With large directories, searching through every entry in the database can have a negative impact on the server performance. Effective indexing can improve the performance in certain scenarios. However, in large databases, this may still not reduce the search scope enough to improve the performance. More options are available when setting resource limits in the command line than through the Directory Server Console. The Directory Server Console sets user-level resource limits. Through the command line, administrators can set user-level resource limits, global resource limits, and limits for specific kinds of searches, such as simple paged and range searches. Section 13.1.3, “Overview of the Searching Algorithm” has more information on how these resource limits affect Directory Server search performance. Section 14.1.4, “Setting User and Global Resource Limits Using the Command Line” lists operational attributes which can be set for each entry using the command line. Use ldapmodify to add the attributes to the entry. Specifies how many entries are examined for a search operation. Giving this attribute a value of -1 indicates that there is no limit. As with the look-through limit, specifies how many entries are examined, but specifically for simple paged search operations. Giving this attribute a value of -1 indicates that there is no limit. Specifies the maximum number of entries the server returns to a client application in response to a search operation. Giving this attribute a value of -1 indicates that there is no limit. As with the size limit, specifies the maximum number of entries the server returns to a client application but only for simple paged search operations. Giving this attribute a value of -1 indicates that there is no limit. Specifies the maximum time the server spends processing a search operation. Giving this attribute a value of -1 indicates that there is no time limit. Specifies the time a connection to the server can be idle before the connection is dropped. The value is given in seconds. Giving this attribute a value of -1 indicates that there is no limit. Specifies the maximum number of entry IDs loaded from an index file for search results. If the ID list size is greater than this value, the search will not use the index list but will treat the search as an unindexed search and look through the entire database. As with the ID list scan limit, specifies the maximum number of entry IDs loaded from an index file for search results, but specifically for paged search operations. Specifies how many entries are examined for a range search operation (a search using greater-than, equal-to-or-greater-than, less-than, or equal-to-less-than operators). Giving this attribute a value of -1 indicates that there is no limit. For information about the parameters listed above, see their descriptions in the Red Hat Directory Server Configuration, Command, and File Reference. 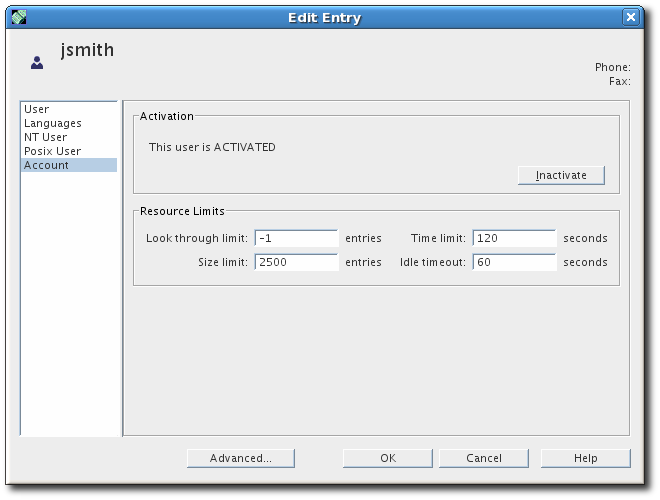 Set an access control list (ACL) to prevent users changing the setting. For details about ACLs, see Chapter 18, Managing Access Control.